The Sunyaev-Zeldovich Array (SZA) is a radio telescope whose purpose is to search for clusters of galaxies in the Universe using the Sunyaev-Zeldovich Effect. The information gained from the SZA will be used to derive several interesting cosmological results such as the matter density of the Universe and the evolution of clusters over time. The Science Goals given below comprehensively detail the wide-ranging impact that the SZA will have on cosmology. The SZA builds on the previous Sunyaev-Zeldovich Effect experiment that was carried out by the University of Chicago. The SZA consists of 8 dishes, 3.5 meters across, which will work together as one unit. Such an arrangement yields an angular resolution that is the same as that of a single telescope whose dish is as big as the largest separation between a pair of the 8 telescopes. The telescopes will be compactly arranged, with the largest separation between the dishes being around 40m. This separation between is somewhat small compared to other interferometers: for example the largest separation of the 2.5m diameter dishes of the Very Large Array near Socorro, New Mexico is 36km. In the case of the SZA, the relatively smaller separation is well suited to the angular size of the clusters of galaxies that it detects. The array parameters have been designed to maximize its sensitivity to the weak signal of the Sunyaev-Zeldovich effect. The telescope will operate in the two frequency bands 26-36 GigaHertz and 85-115 GigaHertz (1 GigaHertz is 1 billion Hertz; for comparison frequencies of a few 1000 Hertz are used in the AM radio band). 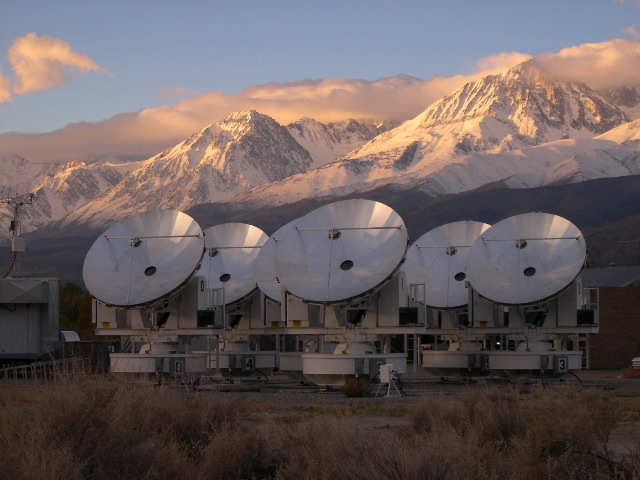 The array will be located at the Owens Valley Radio Observatory near Bishop, California. After its first year of operation it will be combined with the the existing Owens Valley Radio Interferometer (six 10.4 m telescopes) and the Berkeley-Illinois-Maryland Association array (ten 6.1 m telescope) to form one large array called Combined Array for Research in Millimeter-wave Astronomy (CARMA) that will allow for detailed follow-up of the clusters. One of the 8 telescopes of the Sunyaev-Zeldovich Array during assembly at the University of Chicago The SZA will scan around 12 degrees of the sky in search of signatures of the Sunyaev Zeldovich Effect. This effect is a distortion in the cosmic microwave background radiation when seen through a cluster of galaxies. The energetic electrons in the gas between galaxies in a cluster are capable of transferring energy to some of the microwave background photons. This happens to around 1 of every 100 photons, resulting in a deficit of photons at frequencies below 218 GHz and a surfeit of them above this frequency. The distortion is tiny, about one-thousandth of a Kelvin in antenna temperature.